As voice over actors, we talk, we write, we dialogue with other actors, and we commune. The voiceover community as a whole has warmth among its members. Even though we are competing with each other (sometimes daily, and sometimes in the same casting studio) we are somehow part of the same team. We share in each other’s successes, and defeats. We support one another and cheer each other on. 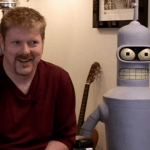 This past Sunday, I got the chance to watch a documentary available this month on Netflix called “I Know That Voice” – conceived and directed by voice actor John DiMaggio who is best known as the voice of the robot, Bender, in Futurama. This film offers a peek behind the scenes at what goes on in the life and work of a voice actor. There are names and faces you may recognize, and many faces and names that you won’t. But to see the real people behind the voices for the animated characters of Judy Jetson, Rocky the Squirrel, Goofy, Daphne in Scooby Doo, Batman, Bart Simpson and more, is to feel like you’re privy to a secret club. The insights and observations they share about how they work is absolutely fascinating. And they demonstrate a camaraderie in their membership that is quite endearing. If you’re a voiceover professional, a filmmaker, a video producer, or just a fan of animation and actors, I highly recommend taking 90 minutes to enjoy this short film. You may just gain some keen insight into the secrets of success for a handful of VO professionals. And you will definitely be entertained.